With so much buzz around Facebook lately, you’d be forgiven for thinking that founder Mark Zuckerberg is the only successful entrepreneur ever to come out of Harvard. 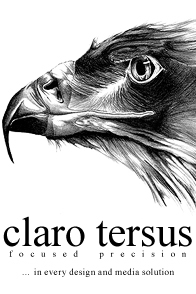 Certainly he’s the most successful, but plenty of other Harvard success stories can be found closer to home. 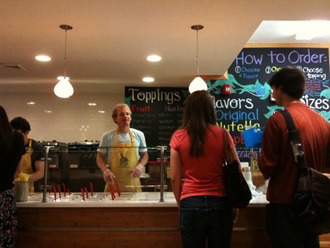 BerryLine, a Boston chain of frozen yogurt stores founded by a Harvard post-doc and one of his colleagues at MIT, is one of them. Their first store opened in Harvard Square in 2007, and they’ve since expanded to the Porter Square and Fenway neighbourhoods and, most recently, a tiny piece of real estate on Newbury Street. 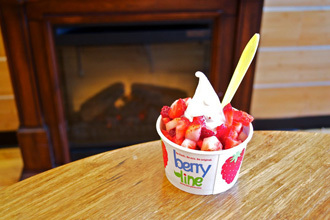 BerryLine began as an idea between Pok “Eric” Yang and Matthew Wallace, who met while pursuing their PhDs in California and were taken by Pinkberry, a local chain. Taking the basic concept, the men infused it with New England charm and ingredients to improve upon the original formula. Their yogurt, by most accounts—including this reviewer’s—is better too, boasting the same tang, consistency, and subtle sweetness of normal Greek yogurt, rather than the sickly sweet gloop sometimes associated with fro-yo. It also means that BerryLine has the same benefits relative to ice cream: it’s healthier, with only 25–30 calories per ounce and very little fat. Yogurt is only the base of the BerryLine experience—literally. Once you have your cup of dairy goodness, the idea is to heap it with the overwhelming selection of toppings. If you are feeling health-conscious you can opt for fresh strawberries, raspberries, kiwi, and banana. There’s also crumbled heath bars, chocolate chips, sprinkles and Oreos, or you can be truly decadent and go straight for Gummi bears. If you are looking for somewhere to begin, I strongly urge a combination of chocolate chip and raspberries. Like Pinkberry, BerryLine’s toppings also include the Japanese treat mochi— sweetish kernels made from sticky rice that have the consistency of marshmallows. BerryLine’s is made in-house, which means it’s not only different from its competitors, it’s often different from itself, with subtle variations in every batch. The other thing that changes regularly at BerryLine is the flavors. Although the original yogurt is always available at each of the chain’s four locations, they also have more than forty rotating “exotic” flavors on tap. The selections vary by store, too. You can visit the Porter Square location for a cup of Taza flavor—an understated and slightly grainy cocoa bean derived from the also-local Somerville chocolate—then head to Harvard Square for a second round with a less grainy and much richer Oreo. Heck, there are so many flavors to sample, like salted caramel and raspberry-lime, why not pull the bike out of the shed and make a day of visiting all four? But if there’s one thing to recommend BerryLine above all else, it’s the ambience on a warm weekend evening. All walks of the city come out to eat and be seen, and because of that the lines often stretch out the door. You also get a fascinating few minutes of people watching while you wait. There are the nerdy Ivy League science grads, sweating into their yogurt in the corner, lifelong Cambridge-residents reading obscure humanities texts, and more than anything else, the happy young professionals that makes Boston north of the river so pleasant in the first place. And if you make your way there on a nice night, you might even find me among my chocolate chips and raspberries. 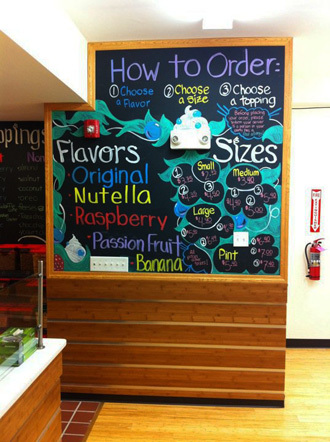 Prices range from $2.75 to $4.90 for yogurt; toppings are extra. 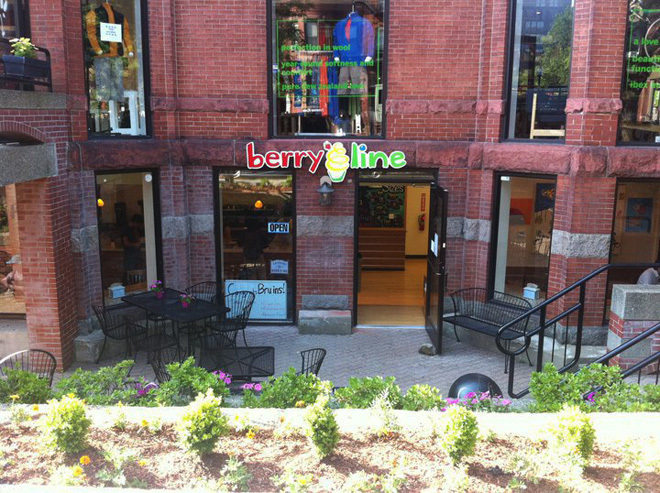 Check www.berryline.com for locations and hours. All photos are copyright BerryLine. No Infringement is intended.